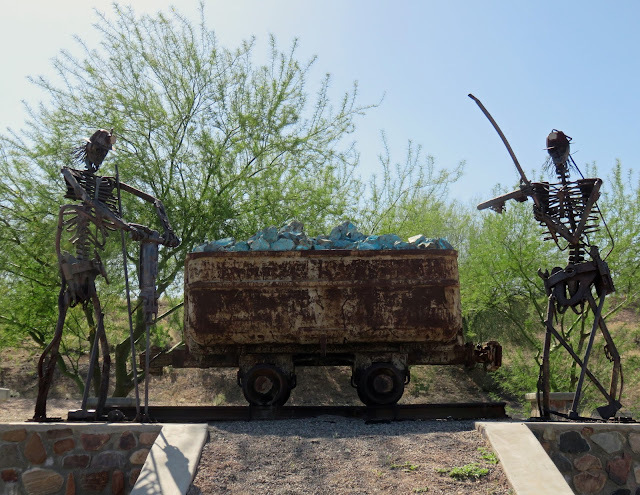 This sculpture, called "Skeleton Crew" was created by artist Jerry Parra. It's on display in Mammoth, Arizona in a small part called Ore Cart Trail. The following information comes from the sign posted at the location. Jerry Parra was born in Tiger, Arizona in 1953 and has lived in the area all his life. He has owned and operated his resale shop "Sue & Jerry's" in Oracle, Arizona for over 20 years. Jerry's art has evolved in the last 15 years, from hand-carved wood Kachinas to fabricated larger than life metal sculptures. Jerry was happy his sculpture "Skeleton Crew" was chosen by the Mammoth community for Ore Cart Trail. This piece represents the mining and copper industry in a very unique way. Although the mines are not like they once were, they will always be a part of the people of this area. Jerry dedicated this sculpture to the hardworking miners and their families, especially honoring those who worked and are still working "The Graveyard Shift". The Town of Mammoth was named for a "mammoth" strike of gold ore found in the area in 1872 a mile or so west of the San Pedro River. Because ores could not be milled at the site, a stamp mill was constructed on the San Pedro River where the community of Mammoth is today. Ores were sent down from the mine to the town in buckets suspended on a wire cable and the returned buckets were filled with water for the mining camp. Through time the mine was referred to as the Mammoth Mine, Mammoth Camp, Schultz, and later, Tiger. Mammoth, at 2,359 feet above sea-level, was originally a one street town extending along a dirt road bordering the San Pedro River. Some of the original adobe buildings still stand along Main Street. Mammoth has transitioned from a mining economy to one focused on light industry, services, and tourism-related activities. It's still a relatively small town - according to 2014 Census Bureau estimates, the population of the town is 1,472 - but it's only 45 minutes from Oro Valley, Arizona, and 60 minutes from the heart of Tucson, Arizona, where you can find just about anything one needs.